Sober Companion is a South African dark comedy-drama television series created by Tiffany Barbuzano and Trevor Gumbi which follows the lead character Trevor (Gumbi) as he guides a variety of addicts on the path to rehabilitation, whilst putting his own sobriety in jeopardy. A sober companion is a "coach" or "minder" that stays with an addict as they try to reintegrate into an addiction free world. The Sober Companion follows four recovering addicts as they try to help other addicts by becoming Sober Companions and putting their own sobriety to the test. The series dives into the infamous world of drug addiction and rehabilitation, as lived by Trevor, as he coaches various addicts while they reintegrate themselves into a world free from addiction. The ensemble cast includes Chris Beasley, best known for his role as Len on Isidingo; actor and musician Kabomo Vilakazi; comedian Tumi Morake and City Ses'la star Meren Reddy. 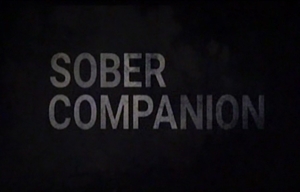 Sober Companion is produced by Gumbi Productions, Ghost Sheep Productions and BBZ Films, with Erika Klopper as executive producer for The Televisionaries. Johnny Barbuzano is also an executive producer. Tiffany Barbuzano is the head writer, with a writing team that includes Gillian Breslin, Johnny Barbuzano, Meren Reddy and Trevor Gumbi. The first episode was directed by Johnny Barbuzano; other directors include Cindy Lee and Sanele Zulu. The music was composed by Neill Solomon.